Join AAAS to unlock access to the latest science news and research—and to support the people making it happen. When you join AAAS, the publisher of Science, you’re not just getting the latest news and research from across the globe. You also become part of the world’s largest general scientific society—a real community of scientists and science supporters. Your membership helps us maintain support for science education, advocate for responsible public policies, and advance science for the benefit of all. All memberships include 50 issues of Science, with your choice of print or digital delivery. You’ll also get unlimited access to all our online articles at sciencemag.org—from any device and anywhere—and lots of other exclusive AAAS benefits. Become a member today for as little as $50 and we'll also send you a limited-edition T-shirt—but only while supplies last. Hurry and join now! Know someone who loves science? Give a gift subscription. There is a limit of one free gift per membership order. Student members who select a digital subscription are not eligible to receive a free gift. Please allow up to 10-12 weeks for delivery. The free gift is provided as is without any guarantees or warranty and cannot be exchanged or returned. In association with the product, AAAS makes no warranties of any kind, either expresses or implied, including but not limited to warranties of mechantability or fitness for a particular purpose. AAAS members are entitled to receive issues published only during their 12-month membership. Science is available to individuals only as a benefit of membership. 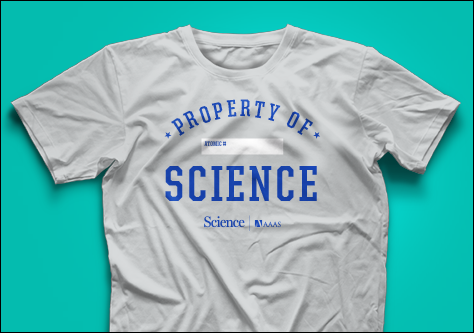 $74, the value of a one-year subscription to Science, cannot be separated from annual member dues. Member dues paid in excess of $74 are tax deductible as a charitable contribution.